Take in all the Wine Country has to offer from this centrally located cozy apartment overlooking Sonoma Creek! With nearby great wineries, tasting rooms, restaurants, and shops, you'll find lots to enjoy in the area. You can take it all in on the 2 complimentary bicycles parked in the shed! Please note! For a reservation to be accepted, you must tell us a bit about who's staying, and what brings you to the wine country. The Bungalow (TOT Cert # 1436N ) features a beautiful kitchen, hardwood floors, a cozy gas 'Franklin' stove for cool nights,, and a sumptuous new Beautyrest queen bed and awesome high thread count Egyptian cotton sheets. Fast internet, cable and internet-enabled TV let you watch cable TV or stream movies. While the apartment is delightfully furnished (we own a furniture store! ), the real attraction is the deck overlooking the creek. From here, you can sit for hours watching the steady stream of wildlife (deer, mostly) as they make their way along the trails along the year-round creek. When the rains start, the creek goes from a lazy creek to a roaring stream - with rapids just a bit past the bungalow, giving great sound effects. The deck features comfortable patio furniture and an optional gas firepit to enjoy a glass of wine around at the end of a busy day! The Queen bed is a new Beautyrest that is moderately firm. Some have said it is too soft. Some have said its too firm. It is what it is! The bed is covered with an Organic Cotton mattress protector/pad. High thread count Egyptian cotton sheets complete the ensemble. Spare blankets and pillows are in the closet. While there are so many activities nearby, we expect that at least one of the days of your visit you'll grab a couple of bottles of wine and want to spend the whole day at the cozy Lazy Oak Creekside Bungalow, enjoying the magical surroundings! IMPORTANT NOTE: To ensure your booking request is accepted, please be sure to tell us a little about WHO is staying, WHERE you are from, and WHAT brings you to the Wine Country! You can read about who we are in our VRBO profile, so its a 2-way privacy street! Avid travelers, my wife and I frequently stay in vacation rentals all over the world. We know what it takes to make a place special, and we know what we need to feel at home! We're confident that our properties will make you feel like you're in your home away from home! This is our second vacation rental, our first vacation rental (VRBO number 497125) is very popular and is nearly always booked! We strive to offer a great value in a fully legal, permitted vacation rental, so you can enjoy our town as much as we do! We purchased this property because we took one look at the last (creekside) unit of this 4-unit (2 duplexes) property, and realized it was a gem we needed to share! The first 3 units are home to people who have lived in the apartments for a long time. The last unit on the creek is very secluded and quiet, and offers incredible creek views and unparalleled wildlife viewing. In the shade of the big oak tree near the rear of the property (hence: Lazy Oak), the large tree provides an idyllic environment for enjoying the wine country. The apartment is tastefully furnished and secluded. The outdoor spaces are oriented for maximum enjoyment of their creekside frontage. 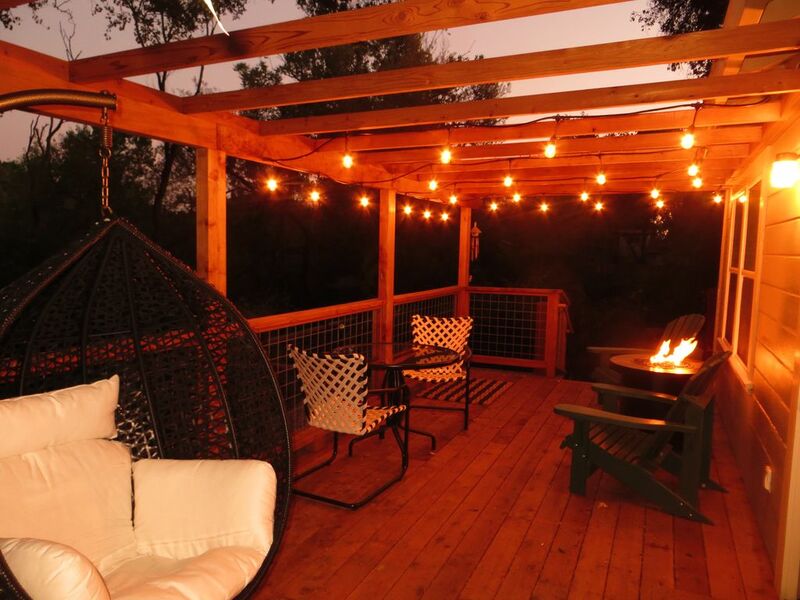 Patio furniture and firepit are provided for your enjoyment of the outdoors. The Creek babbles in the summer, and can roar in the winter. The constant presence of deer, squirrels, birds, and other wildlife in the riparian means you can lose yourself for hours watching as the animals traverse through the trails. Go on photo safari right in Sonoma! Bathroom features a stall shower and new fixtures. Dual-flush toilet helps with the current drought. Perched on the banks of Sonoma Creek, this bungalow sits along the riparian wildlife corridor, offering unparalleled wildlife views from the deck. Usually not needed, but there is a mini-split A/C in the living room, controlled by a remote control. A fan provided to move the cold air around. Cute gas potbelly stove provided for warmth and ambiance. Mini-split also can function as a heater. 800 count Egyptian Cotton bedding provided over an Organic Cotton Mattress Protector/Pad. You sleep like we sleep! Turkish cotton! Soft, thirsty ones! Features comfortable sofa sectional, facing the TV. Tastefully decorated, with a door out to the deck. 4 burner gas stove with full size oven. Full size oven will fit a turkey, should you be so inclined! As more people stay, these items grow! Dishes, bowls, glasses, mugs, prep utensils, everything needed to prepare meals in, if desired. Kitchen features a new appliances. Cabinets are new. Lots of counterspace with the new quartz counters. Microwave and coffee maker provided. There is coffee, filters, and creamer in the cupboard. Cozy round table with 2 chairs for taking meals indoors. There is also a round table and 2 chairs out on the deck, overlooking the Creek. Sony stereo uses your phone as music source, or it has a built-in FM radio. Several sitting areas on the property overlooking the year-round creek. Unfortunately there are steps and 32" wide entry doors. Name your own deer! You will begin to see certain 'individuals', and you can easily lose a couple of hours mesmerized by the wildlife. This place was perfect. It had everything we wanted and needed. The back deck was so nice and so relaxing. Listening to the creek while drinking coffee in the morning and enjoying wine in the evening was outstanding. Very comfortable. Great accommodations. Close to everything. Laundry facilities too. The owners provided detailed instructions on everything and were prompt on answering text questions about restaurant recommendations. Highly recommend. Very cute and cozy bungalow in a quiet area with a great view of the creek from the patio, very relaxing home away from home. You can tell there has been much love put into this place, great place to stay with generous hosts, for a Napa retreat; would recommend to anyone! Thanks a bunch. Place was perfect. We enjoyed listening to the creek in the dark at night. Perfect size for 2 and felt completely secluded like a private hideaway. This place is fantastic, the hosts are fantastic, all around great. Loved having the bikes on site and the creek and back deck area is a perfect place to unwind. Would love to come back - can’t say enough great things and truly had a wonderful time. We really enjoyed our time at the cottage! Cute space, well layed out, comfy bed. Back deck is great! Creek running and fire pit make it very cozy. Only complaint was it wasn’t stated before our visit that the fire pit was an additional expense. When we arrived, we thought we had accesss but didn’t. It was quickly resolved by the owner, but would have been nice to know in advance. Nice location in between downtown Sonoma and Kenwood/Glen Ellen. Would love to go back in the summertime when we could use more of that back deck! Thanks! This property was perfect for our stay in Sonoma. Very clean and nice. We really enjoyed the deck overlooking the creek. It was like having our own private sanctuary. This new vacation rental is located in the heart of Northern California's Wine Country, the Lazy Oak Creekside Bungalow is centrally located to allow maximum enjoyment of all the region has to offer. Minutes from historic Sonoma Plaza, the bungalow is surrounded by world-class wineries, tasting rooms, restaurants and grocery stores catering to discerning travelers! The bungalow is located on Sonoma Creek, offering amazing wildlife views. You'll see more deer than you probably have ever seen before, as you sit on the deck overlooking the wildlife trail along year-round Sonoma Creek. If it rains, then it really gets good, as the roar of the creek down in the channel below provides a thrilling vista as it lulls you to sleep! This property consists of 2 side-by-side duplexes arranged on a narrow lot. Three of the unit are occupied by full-time residents; Lazy Oak Creekside Bungalow is the secluded last unit in the back.